Download "Master of Science. 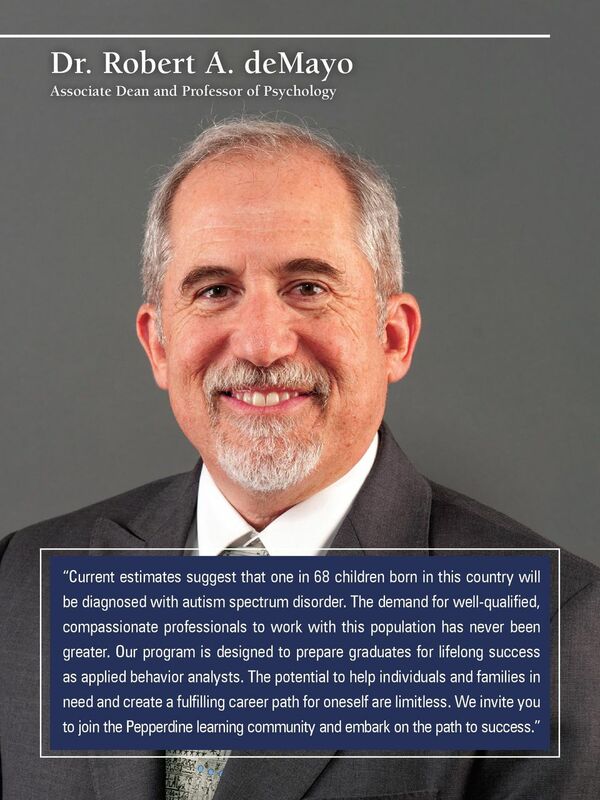 in Behavioral Psychology"
2 Dr. Robert A. demayo Associate Dean and Professor of Psychology Current estimates suggest that one in 68 children born in this country will be diagnosed with autism spectrum disorder. The demand for well-qualified, compassionate professionals to work with this population has never been greater. 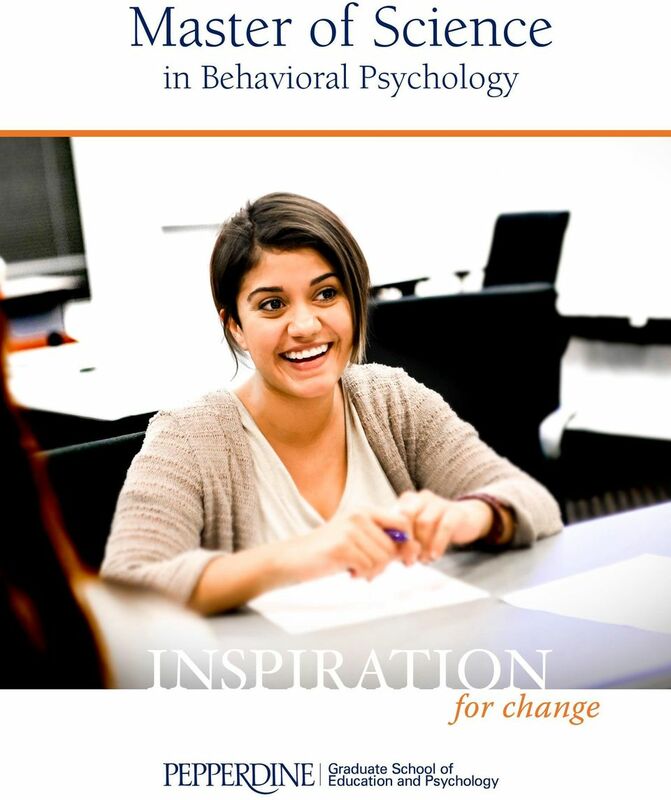 Our program is designed to prepare graduates for lifelong success as applied behavior analysts. The potential to help individuals and families in need and create a fulfilling career path for oneself are limitless. 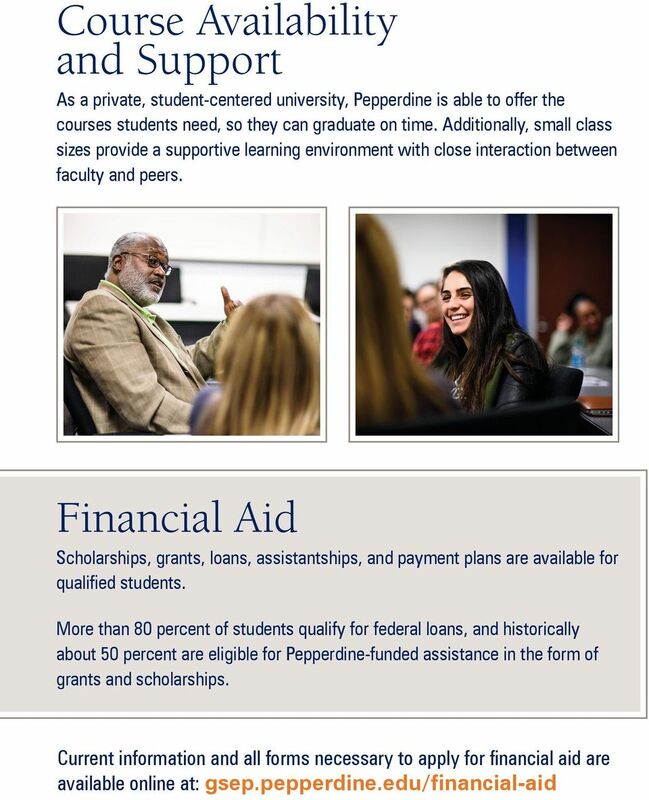 We invite you to join the Pepperdine learning community and embark on the path to success. 3 Our new Master of Science in Behavioral Psychology program is designed to prepare students for careers in applied behavioral analysis (ABA). Students will become highly competent practitioners in this high-growth field. In less than two years, you will obtain the academic preparation required for becoming a board certified behavior analyst (BCBA) through the Behavior Analyst Certification Board. You will also gain a deep understanding of human development throughout the lifespan, knowledge of psychopathology and the process of diagnosis, treatment planning, and intervention to assess, and treat children and adults with autism spectrum disorders. 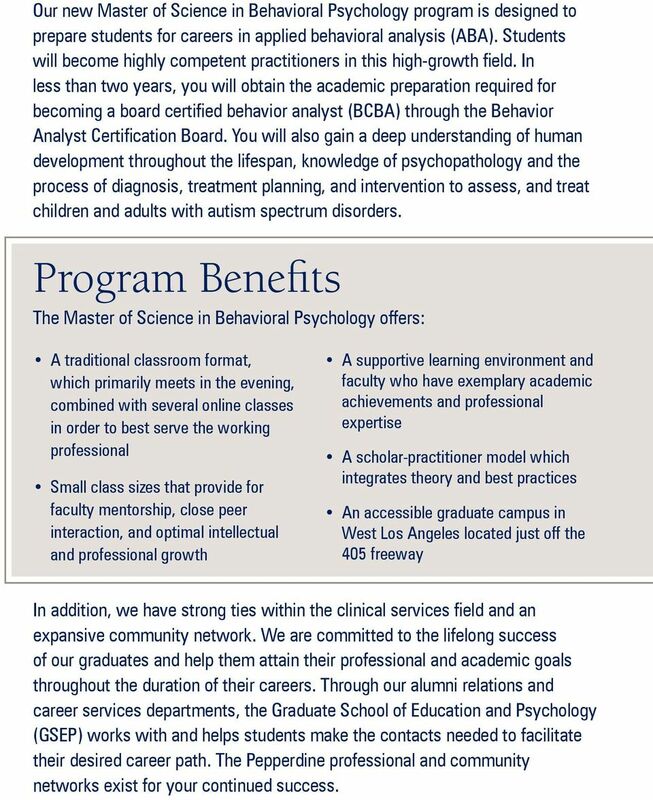 Program Benefits The Master of Science in Behavioral Psychology offers: A traditional classroom format, which primarily meets in the evening, combined with several online classes in order to best serve the working professional Small class sizes that provide for faculty mentorship, close peer interaction, and optimal intellectual and professional growth A supportive learning environment and faculty who have exemplary academic achievements and professional expertise A scholar-practitioner model which integrates theory and best practices An accessible graduate campus in West Los Angeles located just off the 405 freeway In addition, we have strong ties within the clinical services field and an expansive community network. We are committed to the lifelong success of our graduates and help them attain their professional and academic goals throughout the duration of their careers. Through our alumni relations and career services departments, the Graduate School of Education and Psychology (GSEP) works with and helps students make the contacts needed to facilitate their desired career path. 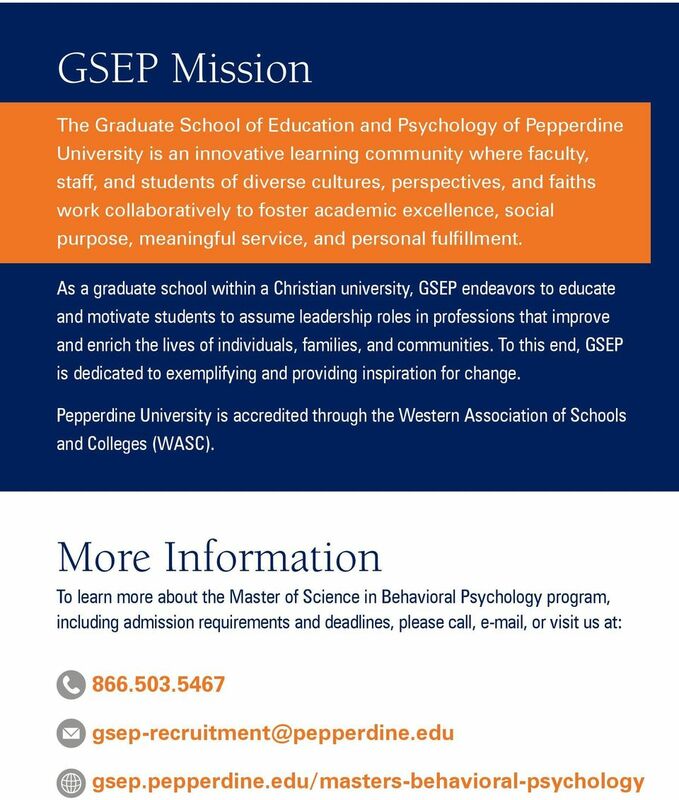 The Pepperdine professional and community networks exist for your continued success. 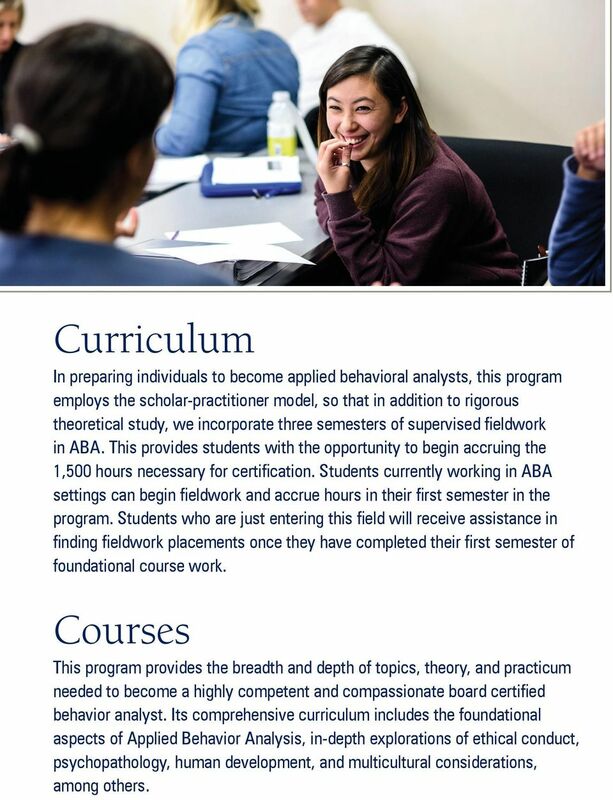 4 Curriculum In preparing individuals to become applied behavioral analysts, this program employs the scholar-practitioner model, so that in addition to rigorous theoretical study, we incorporate three semesters of supervised fieldwork in ABA. This provides students with the opportunity to begin accruing the 1,500 hours necessary for certification. 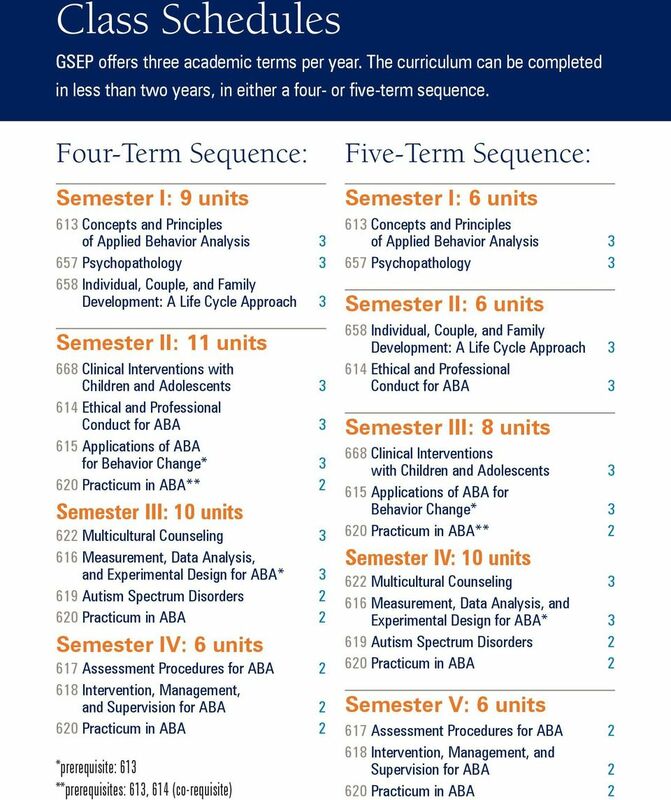 Students currently working in ABA settings can begin fieldwork and accrue hours in their first semester in the program. Students who are just entering this field will receive assistance in finding fieldwork placements once they have completed their first semester of foundational course work. Courses This program provides the breadth and depth of topics, theory, and practicum needed to become a highly competent and compassionate board certified behavior analyst. Its comprehensive curriculum includes the foundational aspects of Applied Behavior Analysis, in-depth explorations of ethical conduct, psychopathology, human development, and multicultural considerations, among others. 9 Faculty GSEP faculty members are accomplished scholar-practitioners in their respective fields. 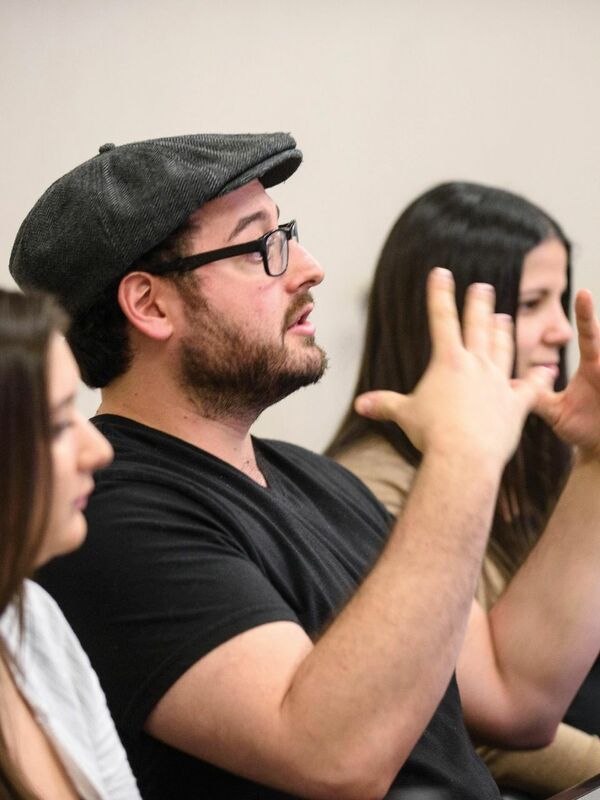 Most classes are structured with an open-forum format to promote faculty-student collaboration, and to provide a challenging and competitive learning environment. Course curricula are regularly evaluated and always relevant. 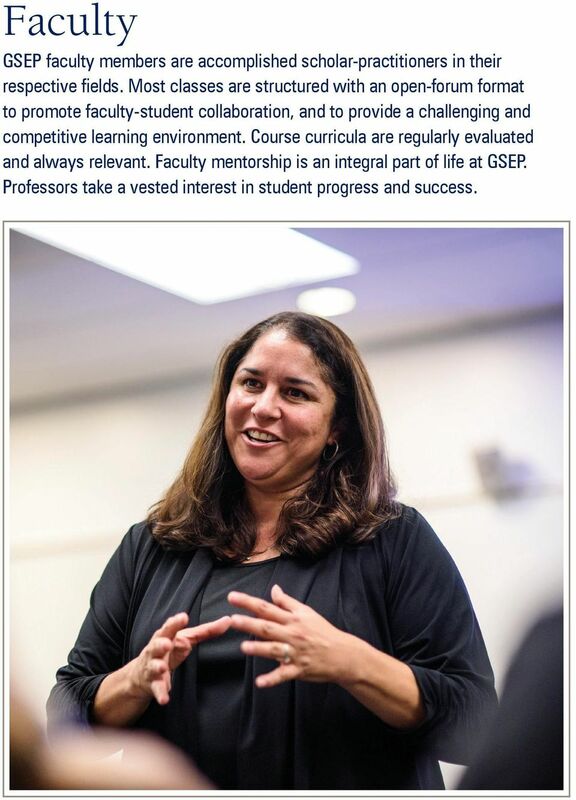 Faculty mentorship is an integral part of life at GSEP. Professors take a vested interest in student progress and success. Art Therapy and Counseling. Listening, creating and healing. Art Therapy and Counseling Listening, creating and healing. Have you been searching for a career that combines your desire to help others with your passion for the healing value of creativity and art making? Overview. Program Outcomes. Azusa Pacific University 1. Program Director: Pedro Olvera, Psy.D. (626) 815-6000, Ext. 5124, polvera@apu. CHANGING THE EDUCATIONAL LANDSCAPE COLLEGE OF EDUCATION We are interested in creating new knowledge, but we don t conduct research just to collect data. We apply those findings directly in the schools. Thank you for your interest in the Post-Graduate Division of the Institute for Special Education. 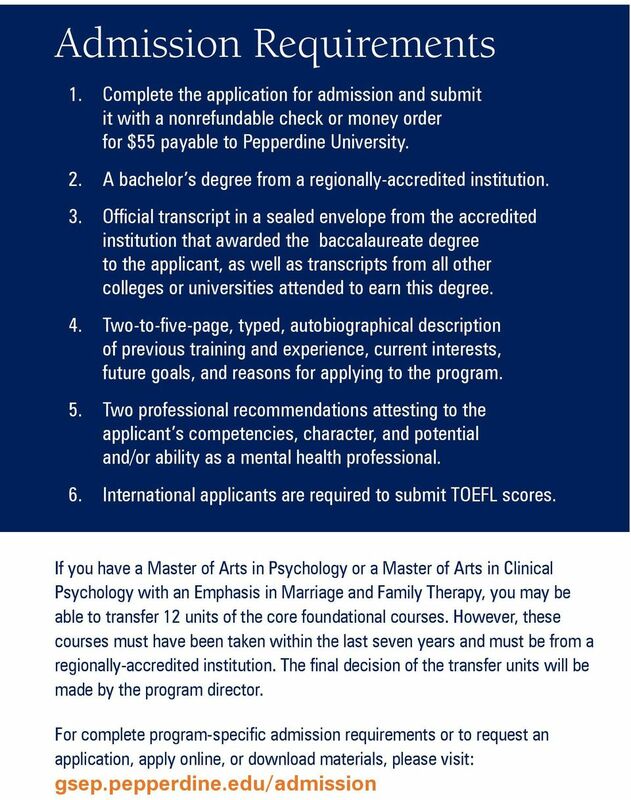 Enclosed is information describing our program. Dear Friend, Thank you for your interest in the Post-Graduate Division of the Institute for Special Education. Enclosed is information describing our program. We have also enclosed an application form. 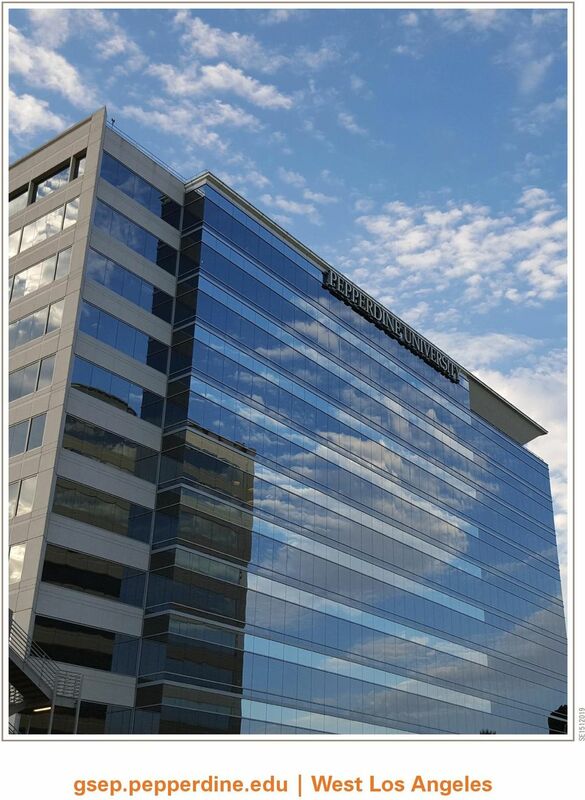 School of Nursing Doctor of Nursing Practice DNP Program Coordinator: R. Morgan The Doctor of Nursing Practice (DNP) degree at King is designed for nurses seeking a terminal degree in nursing practice.